UpScore is the revolutionary productivity software exclusively distributed by The Borelli Group http://www.theborelligroup.com/upscore-page/ to gamify an organization’s best practices to produce measurable employee performance results by increasing productivity in a fun, technology-driven, way. UpScore allows me to customize the activities that will best influence my team, without sacrificing our sense of camaraderie. New research in the fields of positive psychology and team performance management recognizes the “power of play” as a performance strategy. 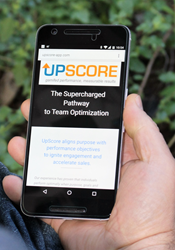 As a result, The Borelli Group launched UpScore; an innovative employee development program that is run by their new online performance optimization game. The UpScore productivity software enables managers to foster connectivity and team building, while improving the specific skills of each employee to keep the team focused and more productive at work. Borelli was inspired to create the UpScore productivity app based on countless negative workforce reports, such as: Gallup polls show that less than one-third (31.5%) of U.S. workers were engaged in their jobs in 2014. This dilemma results in lost revenue, low rates of job satisfaction and increased attrition. Since high engagement is strongly associated with high productivity, this presents a critical business challenge for Managers and employers. The Borelli Group’s UpScore Program combines Coaching and Consulting services for the Managers and their employees, along with implementing the UpScore game app, training employees on how to play the game, and monitoring employee participation weekly. The game itself enables Managers to facilitate the performance measures their organization chooses to focus on through the turn-key program The Borelli Group manages. Clarifying the success factors critical to the organization as a whole directs the choice of goals that the (employee) players can choose from. In addition to working with clients to create these shared goals, players choose individual point-based-best practice habits. Pairing activities with points enables individuals to be rewarded for their unique strengths while working to improve what they see as their weaknesses. The ongoing positive communications-based team connectivity facilitates ongoing communication, as well as recognition for multiple aspects of good citizenship and job performance. The Borelli Group’s clients are finding UpScore to be extremely beneficial. Steve Bonafede, CEO of CSR Real Estate Services in San Jose stated, “It's about team building, I’m always looking for ways to motivate our agents to increase their sales. However, the culture at CSR is very team oriented so I have to be careful about using competition as a driver. But UpScore allows me to customize the activities that will best influence my team, without sacrificing our sense of camaraderie. It's measurable, and we can track results and make improvements along the way. So far the results with my team have been outstanding and my agents really enjoy participating in the game”.